When Melvin Morrison dies, things don’t go quite the way he expects. He finds himself in an in-between land, still able to see his wife and friends, but unable to interact with them or influence their actions significantly. In Twice Melvin by James Pumpelly, Melvin is guided in the afterlife by his long deceased Aunt Martha, who explains to him the whys and wherefores of being dead. Much of what Martha discloses to Melvin will come as a great shock to him and he begins to realize he has a decision to make, one that will impact on everyone in his life and their futures, including future generations. Melvin’s ex-law partner, George, and both of their past philandering will play a significant part in Melvin’s future, both in the afterlife and also back in earth’s reality. George has secret designs on Melvin’s wife and Melvin is none too sure how he feels about that. Add into the mix an incompetent sperm bank and the scene is set for a true comedy of errors. 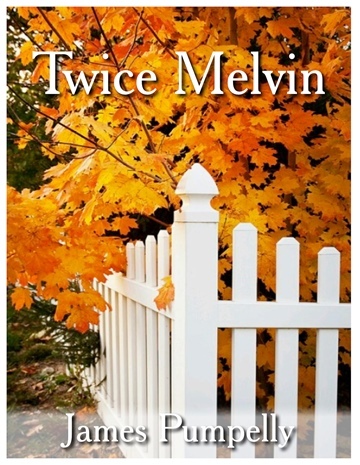 Twice Melvin is a comedic, slightly off-the-wall view of relationships, friendships and human interaction. James Pumpelly’s characters are uniquely drawn so as to emphasize their quirkiness, their eccentricities and, of course, their biases and prejudices. It was a really pleasant surprise for me, as a reader, to depart from the common language of genre fiction and return again to the eloquent, more refined use of the English language, as one might expect from a nineteenth-century novel. This book is contemporary literature and Pumpelly displays both his artistic ability as a wordsmith and a poet. The story is at times, very humorous, but very much in that understated British style of self-deprecating humour. That it was set in and around New England in the stuffy, ‘old money’ society just gave the story a richness and depth that I haven’t read for a considerable time. The premise and the exploration of morality, choices and self-awareness were intricate and well-handled by the author. This is the type of work that demands a reader explore more of this author’s portfolio. It was a pleasant change from my usual reading fare and one to be recommended. Melvin is dead. There's no beating around the bush with that. But what a mess he left in his wake, or rather his Aunt Martha left after a brief possession of the priest to give him the 'no punches pulled' send-off she thought he deserved. His mistress is pregnant, and his wife, Melody, has made her own withdrawal from the Rogue Sperm Bank in the hope of letting her husband's legacy live on. Melvin has a choice: his aunt is insisting he is born again, and he must quickly choose which vessel his soul should enter, the child carried by his wife, or that of his mistress. There are, of course, complications that cause even those against idle chatter to sow the seeds of gossip. Melvin was indeed reborn, and what a stir it caused. Lately, whenever I pick up a book claiming to be comedy, a brief wave of dread passes over me. Today's amusement seems often to be nothing more than a string of put-downs, and jerkish behaviour, something I would call closer to bullying than humour. I actually heaved a sigh of relief when I first started reading James Pumpelly's Twice Melvin. I don't remember the last time a book with such witty humour crossed the screen of my kindle. Only a few paragraphs in, I found myself chuckling, and the momentum continues. Refreshing wit, great banter, some ironic humour, all wrapped up in an interesting and enjoyable plot. This book certainly rekindled my faith in the genre, and restored my hope that there are still people who can be funny, without it being at someone's expense. Within Twice Melvin you'll find some great characters, deep and real with their own unique personalities and agendas. The book itself is written in alternating perspectives between the first person narrative of Melvin (later Melvin Jr.), and the third person perspective of the other characters. Whilst Melvin, for a large portion of the book, is deceased, it in no way hampers the story-telling, and James Pumpelly manages to spin a creative, humorous tale with serious aspects, romance, otherworldly meddling, and mortal gossip. A refreshing read that had me laughing aloud more than once. I liked Twice Melvin by James Pumpelly. There are a lot of reasons for that. First of all, it’s hard not to appreciate the irony of a novel that begins with the protagonist's funeral. There’s just something so deliciously ironic about that. Next, I happen to have lived in Vermont, and had the pleasure to travel around the state a little. It is a unique place with unique people and James Pumpelly captures that unique spirit beautifully. This is not the type of novel I read all the time. I am a Southern man and when I read regional stories they are usually about the South. But every once in a while, I come across a very good novel that takes place in New England. Something like The World According to Garp by John Irving. These are novels that are great American literature, in my opinion. I place Twice Melvin in that category. I can’t decide whether to say it is the characters or the writing that is the best about Twice Melvin. They are so intertwined that it’s like asking, “What comes first? The chicken or the egg?” At any rate, they are both done by a master. James Pumpelly gives us a host of characters, starting with Melvin, and they are all done superbly. The plot is great, if a little unusual, but it fits all the other parts of the story together like the strongest glue. The setting is also top of the line. James Pumpelly weaves together all the components of this tale to create a great American novel.